We all thought we were safe and alone in this world until a UFO joins the Earth’s air space. It becomes suddenly too crowded; that’s when the Others started the waves. The first wave: everything electronic stops working. The second: natural disasters plague the world. The third wave: the ultimate sickness kills almost everyone. The forth wave: there are snipers for those who are left. If you’re still living, the fifth wave is coming. I wouldn’t have read this book if it wasn’t for my brother. 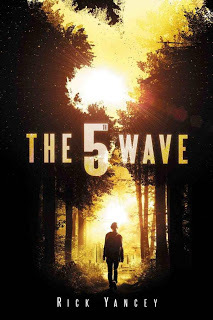 I am not a science fiction kind of girl, I tend to stay away from genres with aliens and robots and things but The 5th Wave sounded so good that I went out and received a copy, even though my brother had already bought himself a copy. Within pages, I was hooked. The thing that got me was that Yancey writes the story in such a way that makes readers believe it could actually happen. Let me just tell you, if aliens ever decided to attack, we would be so screwed. The story is broken down into sections which are separated by different narrators. It was confusing, at first, to change narrators because the sections are pretty lengthy, so you get used to one narrator for a while and then to have it switch on you is disorienting. However, after a few sections, I got a handle on things. Cassie is the best narrator, in my opinion because she has the most captivating story. As much as I would have loved to get into Evan’s mind a little bit more, Cassie was a strong voice that captures the reader. The ending is predictable. I mean, how could it not have been? You tell me right now how a book, about an alien apocalypse, would end if the aliens were already in the fourth wave of taking over the Earth? It wasn’t looking good for us from page one. However, the ending was adorable and even though the pending doom is going to happen when readers close the last page, the happy feeling of the plot connecting together stays with you. Rick Yancey wrote a great story that every sci-fi reader should discover. It captures reality and the story keeps readers on the edge of their seats the entire time. The 5th Wave is definitely something everyone should read, even if you’re not into science fiction, like I am. You’ll be missing out if you don’t read this awesome book. Rated PG-13 for violence, action sequences, blood and gore, and brief language. Sounds like a good idea to me. It's a shame you weren't keen on the predictable ending. I hate when it lets the book down. I'm so glad you decided to give this a try, even though you're not into sci-fi! I really enjoyed this, although I agree that it was all a bit predictable.